Pets Alive | Created by Pets Alive, Inc. BREAKING! Sidewalk Angels Foundation, a New York-based, non-profit organization founded in 2003 by Grammy Award Winning Artist Rob Thomas and his wife Marisol Thomas, has pledged up to $20,000 to help us raise money in Challenge. Every gift made will be doubled up to $20,000! 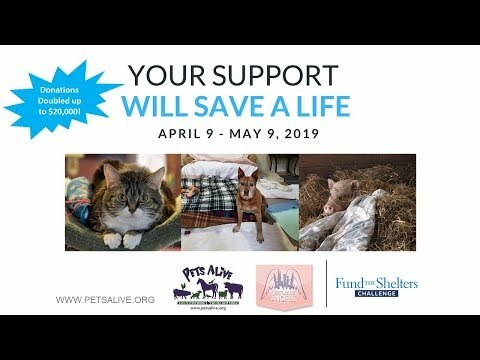 Check out the video for a special message from Cam, a long-time canine resident of Pets Alive and Sidewalk Angels Foundation. Pets Alive is a special place. Just ask Cleo. Annie. Joey - and the other 250 animals here. They all have a story to tell. Some have endured abuse; others have simply been cast aside through no fault of their own. And some got lost and were never able to find their way home. Once they find their way to Pets Alive, their life changes for the better. We treat their injuries or medical conditions and provide basic care such as nourishing meals, vaccinations, spay/neuter, microchip, and deworming. We also provide rehabilitation for scared, behavior-challenged or animals needing extra enrichment to overcome the horrors of their past. But this all takes money - and a lot of it. In 2018, we spent about $110,000 on medical treatments alone. We aim to replenish our Medical Fund during this Fund the Shelter Challenge, sponsored by Michelson Found Animals, who is offering prizes to the top 6 fundraising organizations from $5,000 - $50,000! - Make a donation by selecting the "Donate" button and your donation will be DOUBLED up to $20,000! Every dollar counts. A few examples of how your dollars will help - and don'e forget - each of these donations will be DOUBLED! Note: The minimum donation is $10 and the maximum per transaction is $10,000. Celebrating our 31st year, our mission is to improve the lives of companion animals everywhere by any means possible, including rescue, adoption, advocacy, collaboration, intervention and education. In 2018, we rescued 700 cats, dogs and farm animals and found homes for 584 animals. For additional information, go to our main website at petsalive.org. ps...Thank you Pets Alive volunteer, Britney Schoonmaker, who took most of these amazing photos of our animals! NOTE: The Fund The Shelters Challenge replaces for the former Saving Pets Challenge previously sponsored by Michelson Found Animals. If you prefer to send us a check, please mail it to us at 363 Derby Road, Middletown, NY 10940 and put "Challenge" on the check. While only online donations made on this Challenge webpage count towards the sponsor prizes, ALL donations will be used to replenish our medical fund. Posted by Pets Alive, Inc.